I’ve been playing Pokémon Go for the last three weeks—long enough to collect 53 different Pokémon, develop frenemy relationships with Pidgey and Weedle, and land on some specific feelings about the features and design of the perfect Pokémon Go phone. Would Nintendo ever launch a hardware spin-off, let alone a full-fledged Pokémon Go cell phone? We have to assume the company is at least spitballing ideas. And if Nintendo does decide to release a Poké-optimized hardware container, then it better move quickly. The game is a runaway hit, but when’s the last time you played Candy Crush? And with that, I give you the ultimate phone optimized for Pokémon Go gameplay. Sooner or later, you’ll shop for something inside the game. So why not get those Poké Balls and Lures for more or less “free” by spending money earned through the Google Opinion Rewards app? Google’s app pays you to take random opinion surveys, keeping your Play account packed with loose change. The app is only available to Android users, so making this phone an Android exclusive makes sense. Plus, come on. Apple isn’t partnering with anyone on a silly gaming phone anytime soon. T-Mobile already offers one year’s worth of free Pokémon Go data. It’s a compelling value-add, and that deal needs to be extended to all carriers that sell the ultimate Pokémon Go phone, if only to spike hardware sales and drum up interest. Shoot, while we’re at it, let’s make sure they give away free Pokémon Go data for eternity. Yes, we’d spec this phone with only 16GB of storage, simply to keep costs down. 16GB can easily accommodate storing Android and other system files; Pokémon Go itself (it’s only 128MB upon initial install); countless more Pokémon Go spin-off apps; and a nice collection of music. But storage for a bunch of rando apps and video? Nope. 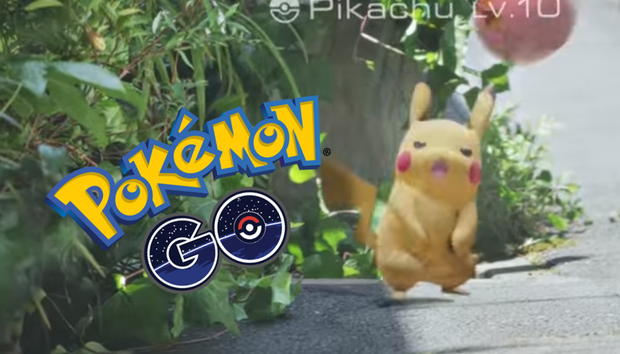 You’re spending most of your day playing Pokémon Go, remember? Note the amount of storage the app takes up when you first install it. So of course you can get by with a 16GB phone. Obviously, the Pokémon Go app would come ready and waiting on the phone’s home screen. You’d also find custom Poké-themed wallpapers, and a dedicated app store (for lack of a better term) that points to Pokémon Go spin-off apps. Just like Samsung’s Galaxy Essentials store points to Samsung ecosystem downloads, the Pokémon Go Store would point to a custom Pokémon Go keyboard with Pokémon emoji and stickers; the inevitable Pokémon Go 2 and Pokémon Go In Space apps; and of course the Pokémon Go Kill’em All Deathmatch spin-off. Hey, it’s a casual game. You don’t need Quad HD graphics, so we’re spec’ing this phone with a 5-inch, 1080p LCD display. A 720p display might make text a bit too fuzzy, so 1080p is a good compromise, as fewer pixels demand less processing power, and that helps save precious battery life. As for the display tech, we’re choosing LCD so that we can outfit the phone with a powerful backlight, ensuring the game is just a bit more visible in bright sunlight. Yes, an AMOLED display could be better for battery life in certain scenarios, but this is a sacrifice we’re willing to make. And it’s all balanced out by improvements in processor efficiency and battery capacity, which we’re about to explain. You won’t need a state-of-the-art powerhouse like the Snapdragon 820 for Pokémon Go. So we’re opting for the mid-range Snapdragon 625. It’s appropriately spec’d for a 1080p display, boasts solid power efficiency, and comes with Qualcomm’s latest DSP and modem tech. The Snapdragon 625 is a System-on-Chip that has all the silicon for GPS and GLONASS global positioning baked inside. This delivers all the location-awareness that helps you navigate to Poké Stops, and spawns new Pokémon in your area. Obviously, this phone would also support A-GPS (that’s Assisted GPS), which triangulates cell tower locations and WiFi hotspots to further improve location accuracy. But none of this matters unless the ultimate Pokémon Go phone also has a chassis design that ensures antennas operate at full strength no matter how you hold the phone. Think about it: Any version of Antennagate would be catastrophic. First, let’s make sure the battery is extra large to ensure the ultimate Pokémon Go phone can last a long time during epic Pokémon hunts. I’m thinking of something in excess of 4000 mAh—and I don’t care if it add a bit of extra bulk. Second, let’s spec the phone with a supplementary battery system, like Motorola’s Moto Mod Power Pack. Snap it on, and you get another half day of game play. And just like the Moto Mod Power Pack, the battery accessory would be fully hot-swappable, giving you seamless game play, without having to power-down and power-up the phone. Hey, we’re designing the perfect game-play experience, right? So let’s spec an extra-strong vibration motor with variable buzz settings. If you sometimes miss the game’s vibration when it alerts you to a nearby Pokémon, you could choose an extra-strong setting to cut through the sensory noise. We also think it would be helpful if the game itself could be tweaked to have custom vibrations for Pidgeys, Zubats and Rattatas. You know, so you could just get an alert that says, “I’m here... but ignore me.” That’s outside the scope of this hardware exercise, but it’s something Niantic should consider. The phone would also be ruggedized to withstand the rigors of all-terrain Pokémon hunting. I’m thinking of a shatterproof display and bumpers like you find on the Galaxy S7 Active. And of course, the phone would also come in three different design themes, so you can let everyone know you’re either Team Valor, Team Mystic, or Team Instinct. What? Too geeky? You’re buying a Pokémon Go phone, junior. You gave up all semblance of dignity when you walked into the Poké Gym.